As an athlete but also as an outdoor activities enthusiast, agility has always been a vital component of my daily training. Exactly because agility has been of such a huge importance in my sports and fitness training, lately I was seriously considering of increasing my agility training with an agility ladder. This ladder would greatly enhance my quickness, my flexibility and balance. The agility ladder market was mostly unknown to me so far. However, as soon as I started looking for a good agility ladder which would quickly improve my acceleration, my balance, my speed and my body control, I came up with the “SKLZ Quick Flat Rung Agility Ladder”. I had to look though, in every detail of this ladder to see if it could actually enhance every aspect of my movement and even strengthen my body. How does the “SKLZ Quick Flat Rung Agility Ladder” work? First, I need to point out that the agility ladders are becoming more and more popular in the sports industry. Here is where the “SKLZ Quick Flat Rung Agility Ladder” stands out. 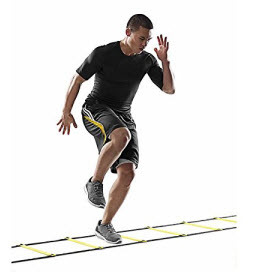 The “SKLZ Agility Ladder” is indeed an amazing fitness equipment that can greatly improve your balance, boost your stamina, your muscle endurance, your reaction time and your coordination between the various parts of your body. It exercises your whole body while you move your feet at a steady pace in and out of the enclosed boxes in the ladder, either forward, sideways or backwards. Let’s describe the basic features of the “SKLZ Quick Flat Rung Agility Ladder”. It features an 11-rung design for extensive stepping which also rapidly increases your upper-level speed. It is very lightweight and portable and you can conveniently carry it and use it outdoors, in your garden as well as indoors in your own home. The “SKLZ Agility Ladder” with its 11-rung heavy duty design for high-intensity training and with its 15 inches from rung to rung, it can certainly offer you amazing improvement in your acceleration, lateral speed and directional agility. It comes to you with durable nylon straps, ground stakes and an instructional DVD. With this DVD, you get incredible agility drills in a 6-week progressive training workout plan. With the “SKLZ Agility Ladder” you also get a convenient carry bag and an integrated storage strap that keeps your trainer tangle free to quick and easy setup. What others are saying? 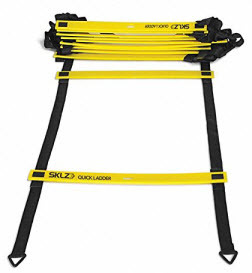 Does the “SKLZ Quick Flat Rung Agility Ladder” deliver? At this point, I have to note that the “SKLZ Quick Flat Rung Agility Ladder” can be used as a fantastic rehabilitation tool after a surgery that you may have. This fitness product can indeed “expand your rehab at home” as it is very practical for you to use it in your own private place. You could not really get a better high-intensity muscle endurance and body control. The “SKLZ Agility Ladder” offers you the best “agility drills and personal training” whatever sport you are involved in from baseball to boxing. You can “use it with all your sports” and when you finish with it “you simply roll it up” and you “put it in the oversized bag”. 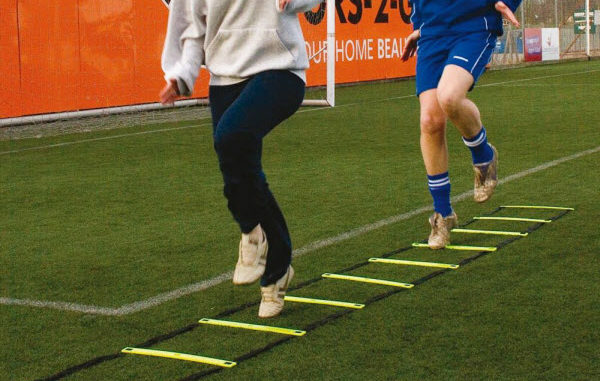 The “SKLZ Agility Ladder” does not only “increase you agility” but it also comes to you with a “excellent quality”. This ladder is indeed durable as it made of strong nylon and very tough plastic ladders ideal for heavy use. It is the ideal fitness equipment for your home workout where you can workout right after you come back from work, take all the benefits from a cardio exercise and additionally help your brain by boosting its power and focus. Another video-review of the “SKLZ Quick Ladder"
In the video below, you can watch a small segment of the "SKLZ Agility Ladder instructional video". 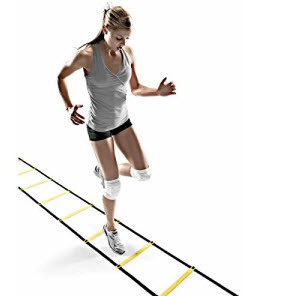 Will the “SKLZ Quick Flat Rung Agility Ladder” help you to get more agile and muscular? You are an athlete and you want to enhance your balance, to improve your rhythm, your running abilities and to advance your body control. The “SKLZ Agility Ladder” will certainly “make your legs faster” and your whole body more agile and easy for you to control. Whether you are a football or baseball or a rugby player or you are involved in any other sport that requires using your feet, the “SKLZ Agility Ladder” will totally “help you to increase your agility” and accuracy and also to improve your speed, balance, timing and coordination. Last but not least, you get all the belefits from an outstanding aerobica exrcise as you are basically running for your health. These core skills are critical to you when you want to perform at a faster level than your competitor in your sport. It may be sewn incorrectly and thus some nylon straps may be twisted. Exactly because the “SKLZ Agility Ladder” is a high quality and well-constructed product, there are only minor problems I have come across. The main issue that I encountered is that the “rungs occasionally slip” which means that you have to put them in the correct position. Another point I would like to raise is that the ladder “could be staked in the middle” as well. Such a feature would hugely improve its stability and therefore the workout you get from this equipment. At this point, I have to point out that the “SKLZ Agility Ladder” is an excellent training tool that can be used “for kids under 10” who play football and they need quick and effective feet training. If you are a coach of an U-10 football team that you need to proficiently “prepare them for playoffs” then, bear in mind that the “SKLZ Agility Ladder” is a “very good product for training”. If you are a parent and “your son plays college football", you can also buy this ladder for his workout. How does it rate overall? It is true that the extreme majority of the people who have used the “SKLZ Agility Ladder” really liked it. I have to mention here that in the average customer review this product has taken a 4.5-star rating out of 5.0. It is also remarkable that out of 27 reviews, 17 of them gave this product a 5.0-star rating while 8 of them gave this product a 4.0-star rating. Where can I buy this product and where can I read more reviews? You can buy this product at a great price on amazon.com. There are also more reviews for you to read and find out what the users of the “SKLZ Agility Ladder” think and how they evaluate it.